Eye Excellence Eye Excellence offers a range of eye services including optical dispensing, specialist contact lenses ocular prosthesis and children's eye health. Based only minutes away from London's Harley Street, we work alongside renowned consultant ophthalmologists in treating mutual patients to the highest quality bespoke care. Our in house optician and ocularist Kanti Fatania FBDO CL FBCLA, has over twenty years' experience having trained at Kingston Hospital, Surrey, St. Peter's Hospital, Surrey and St. Thomas' Hospital in Westminster. He is a registrant of the General Optical Council, the Association of British Dispensing Opticians, and a Fellow of the British Contact Lens Association. Our designer selection includes Ray-Ban, Ray-Ban Polarised, Chopard, Fendi, Mont Blanc, Roberto Cavalli, Prada, William Morris, Dolce & Gabbana, Bvlgari, Francois Pinton and Silhouette. We can make prescription lenses to order, and these can be bi-focal, varifocal or photochromic to your liking. Bi-focal lenses are those that contain two optical powers, each in a distinct separate section, for reading and distance vision. Varifocal lenses contain three different prescriptions for near, mid and far distances. Photochromic or transition lenses are clear lenses that convert to dark when exposed to UV light, thus protecting the wearer from the sun's harmful rays without them having to carry an extra pair of sunglasses. We also have a wide selection of reading glasses ranging in strength from +1 to +3. Eyeform is an accredited consultant dispensing opticians and ocular prosthesis specialists. 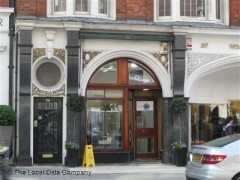 Situated in the very heart of Londons West End and run by Kanti Fatania the objectives of the practice are on providing the highest quality of patient care. Services include dispensing eyewear, sunglasses, contact lenses and specialisms such as ocular prosthesis, custom contact lenses, repairs and children's eyewear.